This part is made up of the following items: 1 x KETO-00 Fuse-switch-disconnector KETO size 00 body (battery isolator) 2 x N5014107-80A NH Fuse-link 80A for KETO-00 Add robust and secure battery disconnection with the Keto range from Jean Müller. They are well known for their attention to detail in ensuring maximum user safety. 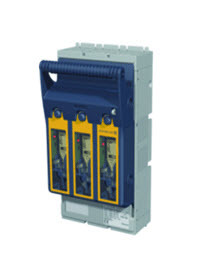 KETO size 00 Maximum DC current = 80A DC voltage rating: 440V Overall width: 106mm System size: 195mm Terminals: M8 lugs with cable area from 25-95mm2 DIN rail mountable This part is the Keto-00 disconnector switch with 2 x 80A fuse links.